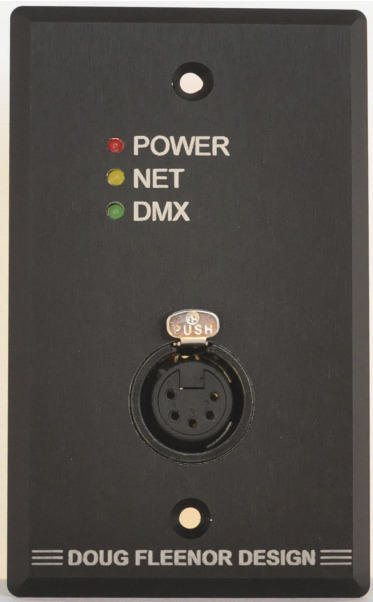 Node1 is a single gang wall mount Ethernet to DMX interface. It has zero boot time* and works with ArtNet (version 3 or prior), streaming ACN (aka sACN, ANSI E1.31, Net3), draft sACN (used by some ETC products), ShowNet (by Strand Lighting), and KiNet (by Color Kinetics). Configuration is done using a web­browser (Internet Explorer, Safari, etc.). Node1 uses Power over Ethernet (PoE) technology so no power supply is needed at the Node1 end. Node1 requires only a single Ethernet cable for power and signal. Node1, like all Doug Fleenor Design products, has a five year manufacturers warranty. Node1 is supplied with either a female (output) or a male (input) DMX connector. * zero boot time: Node1 becomes fully functional as soon as power is applied, unlike many ethernet interfaces that require substantial time to "boot­up".